Four years ago when I went to Prague, I ordered a dish of goulash at a little restaurant near our hostel. It was my first taste of goulash–my first heavenly taste of that paprika-y, hearty stuff–and I’ve loved it ever since. 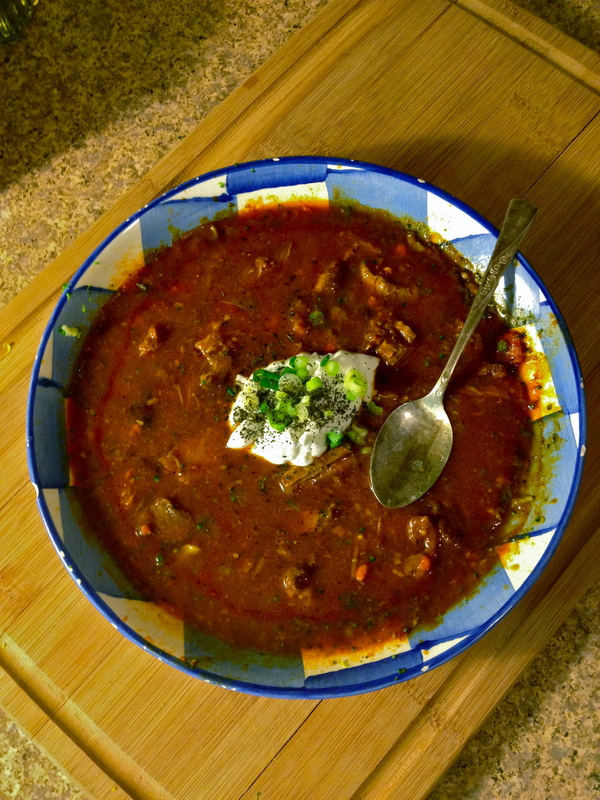 In fact, my goulash might be the first recipe I ever made that I can claim as a Kelly original. That recipe has lived through a few delicious incarnations as I’ve re-worked it through the years; I think this posting is the third version. And it’s by far my favorite. I’ve kept it simple and focused on my favorite flavors, most importantly the deep deep warmth of paprika, which absolutely rocks on a chilly winter day. An homage to my Bohemian relatives and a sweet memory of my trip to Prague, here is my updated recipe for Czech goulash! Heat oil over medium in Dutch oven or other large soup pot. Add onions, carrots, and bay leaf, and cook until transparent. 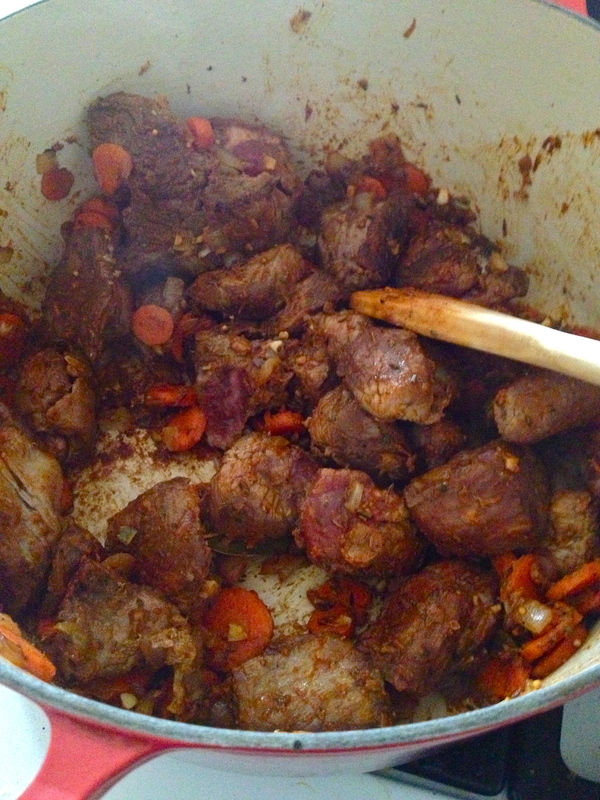 Then add the beef and cook until browned. Stir in the garlic, paprika, thyme, and caraway seed. Cook for 2 minutes, until fragrant. Pour in the tomatoes and 4 cups of stock and add salt and pepper to taste. Bring to a boil, then lower the heat to a simmer. 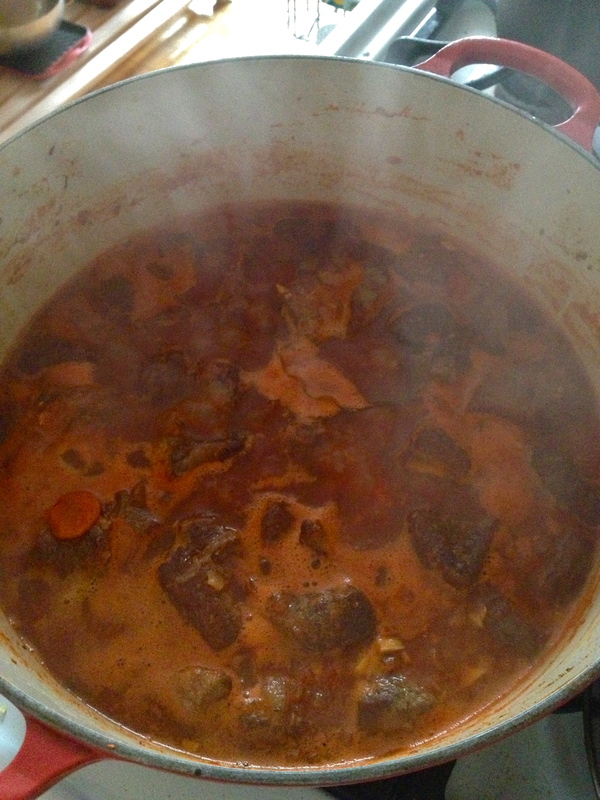 Cover and cook for 2 hours, stirring occasionally and adding more stock if necessary. After 2 1/2 hours, stir in the corn starch. Cook for another hour at least; I like to cook the goulash for a total of 4-5 hours if I have the time. We’re going for fall-apart tender beef that could almost float away in the broth/gravy/stew juices (or whatever they’re called). Remove from heat and fish out the bay leaf. Serve with a scoop of sour cream and a sprinkling of green onion and parsley or marjoram. This stuff is amazing right out of the pot and only gets better as it sits in the fridge! 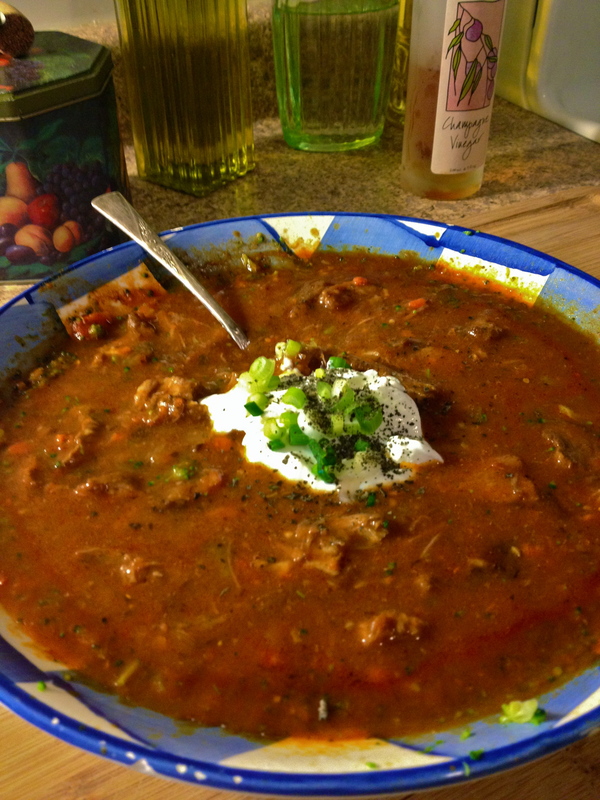 For the updated Czech Goulash recipe, click here. This is my original recipe for goulash. I’ve since updated it, and I really like the new version much better – it’s more potently paprika-ed and also more authentic, in that it’s less like a chunky vegetable stew and more like the slow-cooked, warming, fortifying dish I ate in Prague. I recommend checking out the updated recipe instead, but in case this one tickles your fancy a little more, I didn’t want to delete it! Heat oil over medium in Dutch oven or other large soup pot. Add onions and cook until transparent. Then add the beef and cook until browned. Add garlic, paprika, caraway seed, salt, pepper, and flour, if you’re using it. Stir and cook about 2 minutes, careful not to let the seasonings burn. Then toss in the carrots and celery and cook another two or three minutes, until the seasonings coat the veggies and they start to soften. Add tomatoes and some of the cold water or stock, adding more as needed throughout the process (goulash can be stew-ier or soup-ier, however you like it). Bring to a boil, then reduce and simmer for at least 1 hour, stirring occasionally. I go for 3 hours whenever I can, and it’s worth it! Serve with sour cream and parsley or marjoram for garnish. If you’re using potatoes (which we keep separate to avoid making the soup too starchy) add them to your bowl just before serving.